A limited number of this print from one of my original paintings is still available. Use the "Contact Us" page to place an order. Prints are $50 plus shipping. See the inventory page for new items you can purchase. We create and sell museum quality fine art and future family heirlooms. This online art gallery is totally committed to the business of ART. Our goal is to offer excellent original, one of a kind art and reproductions of those creations. To purchase any originals, use the contact us page and we will invoice you and arrange shipping. 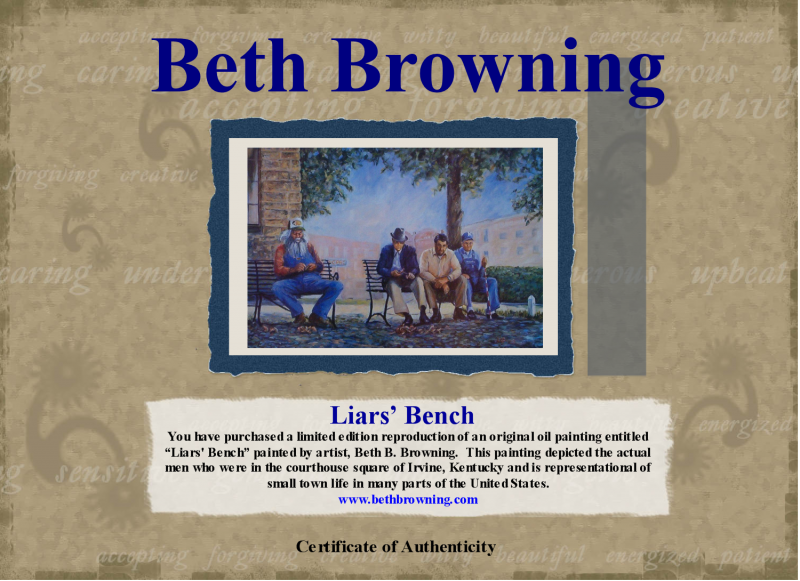 Native Kentuckian Beth Blackson Browning has been a professional artiist for the past three decades. She is a master of oils, pastels, and watercolors in a range of styles. Her interest in art began as a young girl. She worked and studied with Russell McClanahan, her mentor and teacher for 25 years, until his passing. Since her husband's retirement in 2012 she has been living in Florida and embracing the local art community. In addition to her portraits her sporting art paintings are evidence that Beth takes full advantage of growing up in the horse capital of the world. art is not just for museums. Original art is meant to be appreciated and enjoyed in the comfort of your home or office. Copyright 2009 Beth Browning, Artist. All rights reserved.